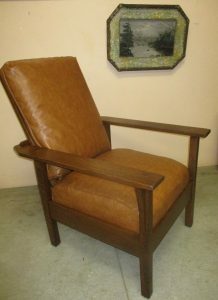 J. M. Young Morris Chair in an open arm design, unsigned. This refinished chair features pegged construction, long corbels and quarter sawn oak. It is larger than many vintage Morris chairs which adds to the comfort level. New upholstery with brown faux leather.